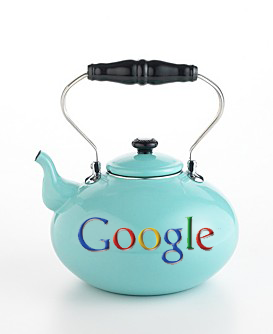 MindBlizzard blog: Google Emissions Crunched as Kincaid gets it straight. Google Emissions Crunched as Kincaid gets it straight. Half a forest was burned on the printing presses and a ton of CO2 blasted into orbit as the Times reported yesterday that "Two Google searches needed the same amount of energy to boil a kettle of water." Tons of blogs and newspapers worldwide dove at the news like hungry vultures to dig this story, like I did in the article "Plant a Tree and get a free search" yesterday.Google immediately denied the alledged amounts of pollution, but it was Techcrunch blogger Jason Kincaid who actually managed to get the facts straight. The quintessence of the story run by the Times was young Harvard physicist Alex Wissner-Gross, who was quoted in saying “that performing two Google searches uses up as much energy as boiling the kettle for a cup of tea”. Kincaid received the article very sceptical and did some proper research. Wissner-Gross says that the widely circulated 7 gram/search figure came from some other source (he’s not sure where), and notes that if you read the article carefully it only makes it sound like it’s from his data. He has confirmed that he did make some vague statements regarding Google, including “A Google search has a definite environmental impact” and “Google operates huge data centers around the world that consume a great deal of power”. But the “tea kettle” statistic that has been repeated ad nauseum simply isn’t his. After learning of the misleading story, Wissner-Gross says that he contacted The Times and was assured that it would be fixed by Sunday morning. No corrections have been made.? This isn’t the first time in recent memory that The Times has been mistaken about a tech story - in late November the newspaper incorrectly reported on a complicated and fictional Yahoo/Microsoft search arrangement. I think the research by Kincaid proves the old media wrong. It's bloggers who get the facts straight and not trained journalists with years and years of field experience and editors to double check. The only problem is.... Google and every other major player on the market is either American or China based, which means they don't really give a **** about the environment. Despite Al Gore and every greenie in the States, every environmental deal is blocked by the United States in favor of economic growth. Where did that bring us? It only brought global crisis. America has blocked deals like the Kyoto protocol so it could continue to produce supersized cars. It has only killed innovation and the United States are now putting billions of dollars into an outdated automotive industry. Cars are too big, engines to polluting for the present day world. No wonder nobody's buying anymore.